Stand in skipper Kieron Pollard scored a belligerent 83, as Mumbai Indians defeated Kings XI Punjab by three wickets in a last ball thriller at the Wankhede Stadium, Mumbai on Wednesday. Mumbai included Siddhesh Lad in place of injured Rohit Sharma, while Punjab dropped Mayank Agarwal, Mujeeb UR Rahman and brought in Karun Nair and Hardus Viljoen respectively. After being put into bat by the home skipper, KXIP opening pair of Chris Gayle and KL Rahul started cautiously, but after the powerplay picked up the scoring rate as the duo added 116 runs for the opening stand, before Jason Behrendroff got the prize scalp of Gayle for 63. David Miller who was promoted at No 3, failed to get going as he was dismissed Hardik Pandya. Mumbai Indians in the final stages claimed the wickets of Karun Nair and Sam Curran to peg the visitors back. KL Rahul then took on the 25 year old Hardik by smashing him for 25 runs in the penultimate over. The former reached his maiden IPL hundred off 64 balls, as Kings XI Punjab posted a competitive total of 197 for 4 in 20 overs. Chasing a target of 198, Siddhesh Lad and Quinton de Kock provided a brisk start by adding 28 runs for the opening wicket, before Mohammed Shami got the early breakthrough by dismissing the debutant Lad for 15 runs. Suryakumar Yadav and Quinton de Kock who were dropped by David Miller and wicket keeper Rahul ,failed to capitalize on the opportunity as they both fell for 21 & 24. Pollard and Ishan Kishan added 32 runs for the fourth wicket, before the latter was run out brilliantly by Sam Curran. Indian all rounder scored 19 off 13 balls before Shami dismissed both the brothers in the same over as Mumbai Indians slumped to 140/6. The 31 year old Trinidadian decimated the Kings XI Punjab bowlers by smashing them to all parts of the ground and reached his fifty off just 22 balls. Alzarri Joseph held his nerve as he along with skipper added 54 runs for the seventh wicket, before the former in the last over after smashing a six off a no ball and a boundary off the free hit was caught by Miller off Ankit Rajpoot for a breezy knock. His knock comprised off 3 fours and 10 sixes. 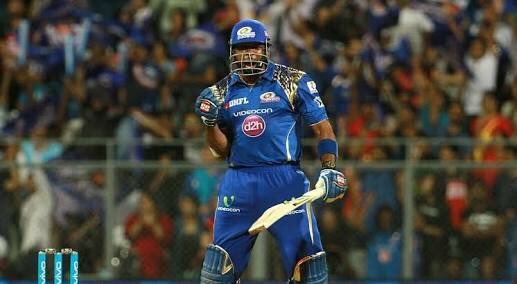 With 2 requiring off the final ball, Joseph scored the winning runs to give Mumbai Indians a sensational win. With this victory, Mumbai have jumped to third position, while Kings XI Punjab are placed in fourth position. The 25th Match of the Indian Premier League will be played between Rajasthan Royals and Chennai Super Kings at Jaipur on 11 April Thursday.